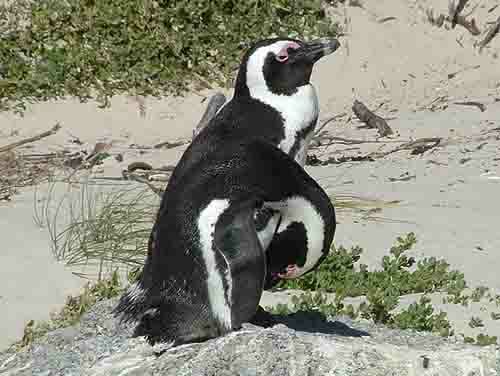 A highlight of any tour around the Cape Peninsula is a visit to the Boulders penguin colony near Simonstown. This colony began in 1982 when two breeding pairs of African penguins (previously known as Jackass penguins) arrived on the beach at the Boulders, and decided to stay. For conservationists this was a great day as the history of penguin colonies along our coastlines is a sad one. A once thriving population of over 1.5 million birds in the early 1900's was reduced to about 150,000 birds by the end of the century placing the African penguin on the endangered list. The colonisation of the Cape was disastrous for the penguin colonies and is the main reason for the large drop in the penguin population on the islands along our coastline. Not only were about six million penguin eggs harvested each year in the early 1900's which had a devastating effect on the penguin population, but their nests were also destroyed by guano collectors when scraping the guano off the rocks. A further problem causing the drop off in the numbers was the overfishing of the shoal fish which the penguins feed on. The African penguins which arrived at the Boulders started a whole new era in the lifestyle of penguins along our coastline. Firstly they became one of only two colonies based on the mainland of South Africa, the other being the Stony Point colony near Betty's Bay. 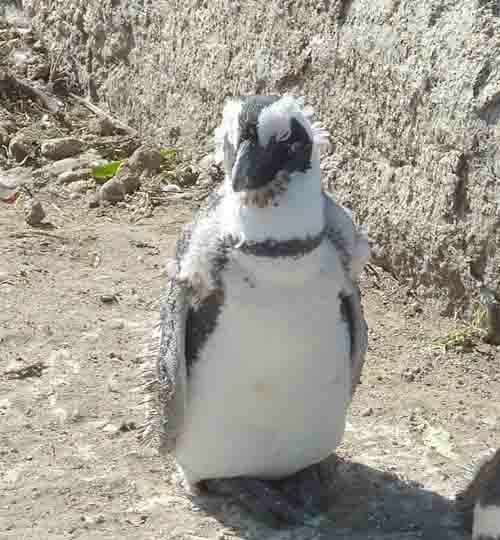 When they arrived and started breeding they did not stick to the beach area around the Boulders but moved up into the residential area of Simonstown where they moved into people's gardens and burrowed in lawns and beds to make nesting areas for themselves. This immediately put the penguins at odds with landowners and pets. Many penguins crossed the busy roads in the area to get to their chosen gardens and a number were killed by cars as they crossed the roads. It did not take Cape Nature Conservation long to realise that they had a growing natural asset on their doorsteps and that it would be a good idea to protect it for the future. To do so they decided to fence off the beach and the vegetation belt above it and restrict access to the area to allow the penguins to live and breed as they would do on the islands. The project has been extremely successful and the colony now numbers some 2800 penguins. Controlled access and the building of walkways inside the fenced off area allows visitors to the colony get really close to the penguins without disturbing them during their natural life cycles. For people like me who get to see the penguins on a relatively regular basis watching them is a really interesting pastime. From late November onwards the penguins start moulting and because of the loss of their feathers and the natural oils in them are confined to the beach for about three weeks. 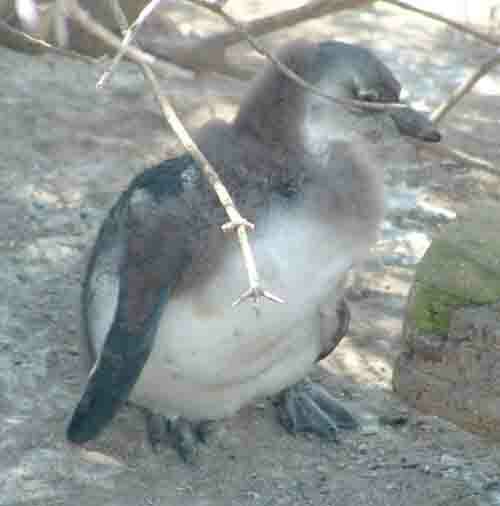 During this period the penguins cannot feed and sit on the beach looking scruffy, itchy and irritable. Just let another penguin get too close and he/she gets a good nip from the offended penguins. 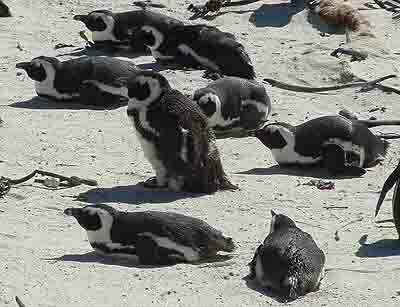 Before arriving on the beach to moult penguins spend time at sea fattening up. Half of their body weight is lost while moulting and by the end of the moulting season they need to go back to sea for about six weeks to fatten up again. Once they have regained their lost weight they return to shore to start the breeding season. Penguins are monogamous, and are much like homing pigeons which return to the same nest to breed each year. Between 80 and 90% of pairs remain together in consecutive breeding seasons. Once the breeding pairs arrive back on land at the Boulder's colony they choose their nesting sites either on the beach or under the trees that line the top end of the enclosed area where they proceed to burrow into the ground or under trees or rocks to make a nest. It is really interesting to watch the penguins preparing their nests especially on the beach where they dig a hole in the sand. As the female digs the nest one just sees a fountain of sand flying out of the hole being prepared. The poor male watching the process gets covered in flying sand. Once the nest is complete the couple act a lot like courting humans do. They preen each other's feathers and the male nuzzles his beak into the female's neck using his wings to embrace her while doing so. If after all this loving attention the female is ready to mate she lies down and submits to the male. Sometimes, just like humans the females refuse to submit and then the males try and force their attentions on the females. I saw an incident like this happen a few days ago when a female being persued by a male refused to submit to his attentions and threw the male off each time he tried to mount her. This happened a number of times and eventually two penguins who were watching the male's antics decided enough was enough and tackled the male and sent him packing allowing the female to escape. They looked just like two policemen assisting a lady in distress. Once the mating process has taken place two eggs are laid in the nest. The incubation period lasts about 40 days with each adult spending about 2.5 days on the eggs on a rotation basis while the other adult goes to sea to feed. During the incubation period the penguins have to keep a constant watch on their nests as the Kelp gulls have no qualms about landing in the middle of the colony and stealing any unprotected egg or new born chick left unprotected. At the Boulders many of the penguins dig their nests under the trees that form part of the fenced off area and those that do are protected from the sun and the gulls. The birds that have built nests on the beach are at risk of losing chicks and eggs. Once the eggs have hatched both parents brood the chicks who require constant attention for the first 15 days as they are unable to control their own body temperatures at this stage. The parents however cannot leave the chicks as they are still at risk from predators. Once the chicks are about a month old they can be left alone while the parents go to sea to find food. During the time the adults are away chicks who are left alone get together and form a creche to protect themselves from adult birds who tend to attack them should they get too close or stray into their nesting area. At this age the chicks still have no feathers and are just a ball of fluff. From about two months of age they start moulting and lose their fluff and gain their blue feathers. During this stage the adults continue to feed the chicks which often grow fatter than their parents. Once the Baby Blues have all their blue feathers they leave the colony and go to sea for a period lasting between twelve and twenty two months only returning to the colony when it is time for them to moult into their adult plumage. When the young penguins have attained their adult plumage they are old enough to start breeding but normally wait until they are about four years of age before doing so. Their normal breeding age is between two and six years. Penguins in the wild can expect to live to the age of about 12 to 15 years while in captivity they can live to about 20 years. 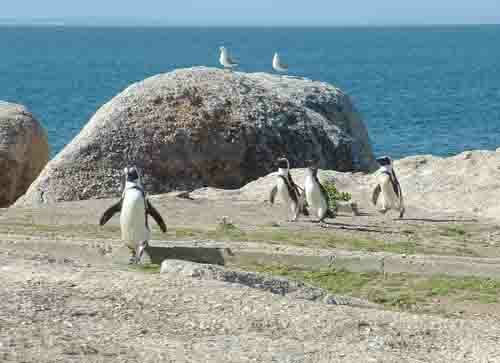 The penquin colony at the Boulders is an experience that no visitor to Cape Town should miss. 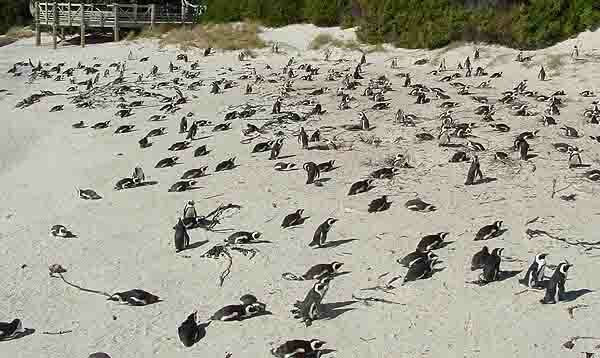 The sight of the African penguins marching down the sand dunes in formation, or picking fights with one another or the kelp gulls or just tanning on the beach with their beaks open is an event that you will not experience anywhere else in the world but in Cape Town.. Bring your cameras and join the penguin paparazzi at Boulders on a full day tour of the Cape Peninsula.